Deadmau5 & Kaskade, Steve Angello, HouzeCrushers vs. Daft Punk, Axwell, BT Feat Jes and more. 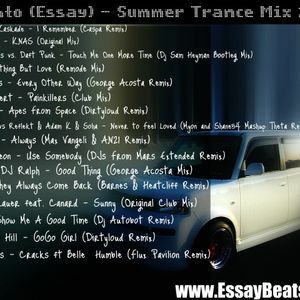 Summer Trance Mix 2010 is the latest addition to Trance mixes by Dj Ahto. Dj Ahto is also known by his Hip Hop Alias "Essay". Considering the large focus of his hip hop music production Essay still remains humble and true to his musical roots by creating some of the smoothest blends of Trance and House. With each Mix created, his skills seem to improve and increase in quality and online following. Enjoy the mix and please spread the word of Dj Ahto Trance Mixes.